45. 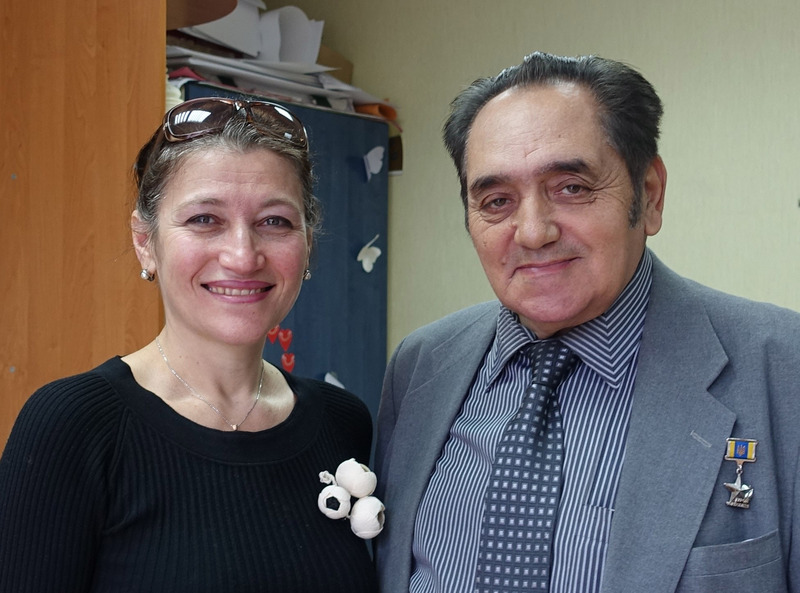 Rabbi Moshe Moskovitz, a native of Caracas, has served the Kharkiv Jewish population since 1990. He is highly respected in the city and beyond. He presides over a large choral synagogue, a local landmark. In addition to a number of education programs, the Chabad community under his direction owns and operates its own summer camp for Jewish children and also maintains significant nutrition and pharmaceutical assistance programs for Jewish elderly. Rabbi Moskovitz described the local economy as "close to catastrophic." The cost of all utilities and other city services has risen substantially. Businesses have closed or downsized, leading to severe unemployment. Several banks have failed, Rabbi Moskovitz said, leaving depositors with nothing. The number of Jews seeking assistance from the synagogue has escalated significantly, he continued. Many of them, he noted, had been firmly middle class individuals before the recent crisis. The middle class, he observed, has disappeared. As more people become desperate for money, crime in the city has escalated significantly. Rabbi Moskovitz stated that contributions to the Kharkiv Chabad community fund had declined by 70 percent. Whereas it was understood earlier that major donors would pay in dollars, those who remain able to pay now do so in Ukrainian hryvnia. Desperate over his declining wealth, a major donor (who also was chairman of the hesed) committed suicide. Oligarch Oleksander Feldman, who delighted in coming to the synagogue to personally disburse $15,000 to needy Jews each month, no longer is able to be so generous and clearly is uncomfortable about his new situation. In response to his straitened financial circumstances, Rabbi Moskovitz has laid off staff at every level, including rabbis who were teachers. He has made no comprehensive downsizing plans, but watches the situation very closely and adjusts synagogue-related activity accordingly. It is obvious that many people are struggling and are worried about their future. The community Pesach seder this year drew over 1,000 people to the choral synagogue; the community at large gathered on one floor, children from the Chabad school were on a second floor, and local students were on a third. Clearly, people are searching for community at this difficult time. Also, aliyah to Israel has increased markedly, especially by families with sons who are approaching draft age for conscription into the Ukrainian army. Some teens go to Israel on their own, joining the Na'aleh high school in Israel program. Other Jews, said Rabbi Moskovitz, are not ready to leave just yet, but are organizing their documents so that they can leave quickly at a future time; they come to him for attestation of their Jewish heritage, confirmation of which is necessary in order to be admitted to Israel under provisions of the Israel Law of Return. Unfortunately, Rabbi Moskovitz acknow-ledged, some Jews still want to relocate to Germany. 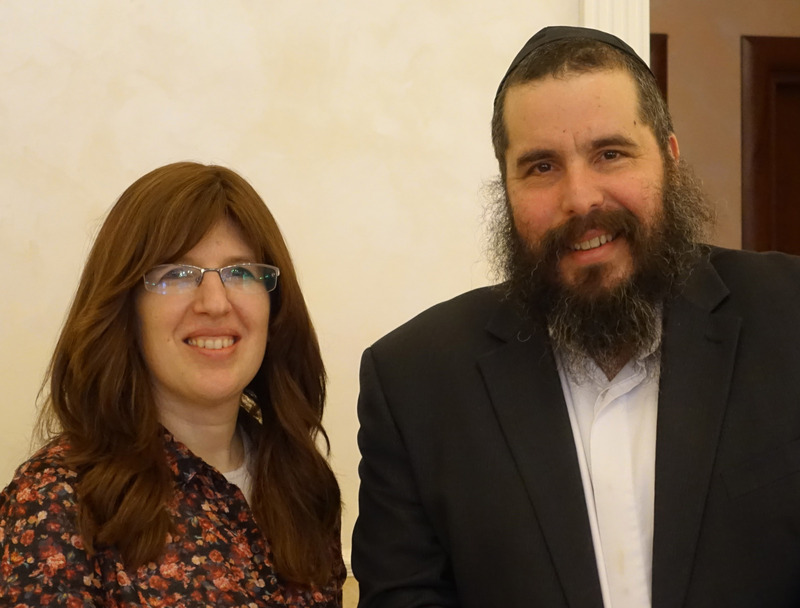 Rabbi Moshe Moskovitz and his wife Miriam arrived in Kharkiv in 1990. Mrs. Moskovitz is very active in community affairs, especially in Jewish education. Antisemitism in the area is "probably stable", said Rabbi Moskovitz. Both pro-Ukrainian and pro-Russian nationalism seems to have diminished from their previous high levels, he stated. People are subdued. They are disillusioned that previous political activism had yielded no significant changes. The economy is terrible. Local residents are aware of the devastation further to the east in Donetsk and Luhansk; no one wants such a situation to arise in Kharkiv. 46. The Jewish Agency for Israel maintains its eastern Ukraine head office in Dnipropetrovsk. One of the two Israel shlichim (emissaries) posted in that city visits Kharkiv every month, sometimes remaining in the city for almost a week. The writer was unable to visit a small JAFI office in Kharkiv, which is staffed by local coordinators who operate several Jewish identity and aliyah-related programs. 47. The writer also was unable to visit the Kharkiv regional office of the American Jewish Joint Distribution Committee. 48. The Government of Israel maintains a Consulate and Israel Cultural Center in Kharkiv. The Consulate serves three major functions: (a) it checks eligibility for aliyah to Israel and issues visas to qualified candidates; (b) it promotes aliyah through various programs; and (c) it represents the State of Israel in Kharkiv, the second largest city in Ukraine and an academic and technology center in the country. Kharkiv is considered by some to be an unofficial capital of eastern Ukraine and is host to a number of foreign consulates. As was the case in 2014, an official at the Consulate reported increased interest by local Jews in assembling all required paperwork for aliyah to Israel. Families with young children tend to leave Kharkiv en route to Israel as soon as they are able to make all necessary arrangements, whereas some middle-aged people prefer to remain in the city for awhile, confident that they have all essential documentation should it be advisable to depart suddenly. The Consular official did not know the number of internally displaced Jews in Kharkiv. It is impossible to know, the official explained, because they do not report to a central authority. Some, particularly the elderly, go to the hesed; others come to the Consulate or go to the Jewish Agency or the synagogue; and yet others simply find housing and employment on their own without registering with any Jewish organizations. Further, some move from one place to another so frequently that the Consulate cannot keep track of those who do express an interest in aliyah. Another major issue is that some IDP's fled their homes in the eastern regions without any documents at all, making their claims to Jewish heritage very difficult to trace. Even with documents, archival resources in the Donetsk and Luhansk areas are not easily accessible in these turbulent times. In response to a question about the number of Jewish scientists and physicians remaining in the many academic institutions and scientific centers for which Kharkiv is well-known, a consular official said that many younger people in this category have left. Many of the middle-aged and older scientists remain because they fear a loss of status in Israel or elsewhere; few speak any languages other than Russian, so it is difficult to find employment in other countries commensurate with their past positions. However, "They send out their [own] kids to the Technion." Doctors and musicians also have emigrated. Among the departing musicians are music teachers, depriving the city of its future cultural richness. Fewer and fewer families can afford music lessons for their children, so many music teachers are underemployed. In general, stated the official, the caliber of Kharkiv academic and scientific institutions has declined significantly in recent years. With the intention of generating more revenue, these institutions have been accepting increasing numbers of students from developing countries (including those in Central Asia) whose governments pay full tuition for them to study in Kharkiv. However, many of these students are poorly prepared for post-secondary education and the Kharkiv institutions have had to reduce their standards in order to accommodate them. About 60 percent of all students in the city are from developing countries, the official said. The official described the mood of the city as depressed. People are not hysterical, although some worry about a Russian invasion. The city of Zaporizhzhya (known until 1921 as Aleksandrovsk) is the administrative center of Zaporizhzhya oblast (region), which lies immediately south of Dnipropetrovsk oblast. The cities of Dnipropetrovsk and Zaporizhzhia both on the Dnipr River, are about 50 miles apart. Zaporizhzhya was established in the late sixteenth century by roving bands of local Cossacks known as Zaporizhzhyan Cossacks. Their descendants remain in the area today, although they are less numerous and less well known than the Don Cossacks to the east and Kuban Cossacks to the southeast. A major nuclear power plant on the Dnipr River powers a local industrial base, including metallurgy, transportation equipment, and chemical plants. Zaporizhzhya also sustains a food processing industry based on agricultural production in the area. However, the economy is seriously depressed. The current population of Zaporizhzhya is about 753,000, the sixth largest city in Ukraine. According to Chabad Rabbi Nochum Ehrentroi, the Jewish population is probably between 10,000 and 11,000, of whom perhaps 5,000 to 6,000 are Jewish according to Jewish law (matrilineal descent). 49. Chabad maintains a preschool and an eleven-grade day school in separate locations in the city. The preschool enrolls 38 children in a large, renovated building with ample outdoor play space. The day school, School #59, enrolls 120 pupils, a census that declines from year to year due to substantial emigration from the city. According to School #59 administrators, the school does well in city competitions in English, Ukrainian, and Ukrainian history; lacking science laboratories at the school, pupils do less well in biology and chemistry competitions. School #59 administrators Anya Podlevskaya, left, and Larisa Bobakova, right, said that inade-quate financial resources limit their ability to hire the best qualified teachers in the city. In the photo at right, a small child sleeps during naptime in the preschool. All nursery schools and kindergartens are required by law to provide cribs or cots for children during a designated naptime. Rabbi Ehrentroi later showed the writer a large building that he hoped to acquire as a combined facility for the preschool and day school. It is especially vital to replace the day school, he said, because its location in a remote area of the city deters enrollment. Further, the new property would permit the development of science laboratories and other instructional spaces that the current facility cannot accommodate. 50. The writer was unable to visit a second Jewish day school in the city, a school sponsored by ORT, because its principal was unavailable. 51. The Max Grant Jewish Culture Center was opened by the Joint Distribution Committee in 2004. Located on a central street in Zaporizhzhya, the three-story building hosts the JCC on its upper two floors and the local hesed on its ground floor. The JCC is considered one of the most dynamic, creative JDC Jewish culture centers in all of the post-Soviet states. Its director, Inessa Nosenko, described a robust program of activities for children, youth, and adults. These include art, dance, drama, fitness and sports, and a summer family camp. Most of these activities are fee-based, said Ms. Nosenko, but children from disadvantaged families participate without charge. The Family Service unit, which is a section of the JCC, organizes various activities for people with disabilities and has lobbied the city for handicapped access to buildings and city vehicles; it has requested that city buses be equipped with access lifts, which are uncommon in the post-Soviet states. In an effort to encourage greater sensitivity to the needs of people with disabilities, the JCC offers special recognition to bus drivers who offer assistance to seniors and disabled people. The Family service unit also organizes visits to the chronically ill and operates an apartment repair program that focuses on the housing needs of elderly and disabled individuals. In response to a question about internally displaced Jews, Ms. Nosenko said that approximately 500 had passed through Zaporizhzhya. About 300 have received some services from JDC or from Chabad, but others have managed on their own, received assistance from relatives, or remain in regional/city shelters. Eighteen families are housed in a Chabad dormitory and receive JDC assistance there. (See below.) Some IDP's clearly have psychological issues, she stated. Unfortunately, continued Ms. Nosenko, no work is available in the city. Inna Nosenko and Anatoly Schvelv direct the Jew-ish Culture Center and the hesed respectively in Zaporizhzhya. See the following page for informa-tion about the hesed. Speaking about conditions in the city in general, Ms. Nosenko said that the local economy has "collapsed." Many factories have closed and an entire supermarket chain went out of business. The unemployment rate in Zaporizhzhya is 38 percent, she stated. Many Jewish families are leaving Ukraine. She worries most about internally displaced children, many of whom are seriously depressed; their problems started, she continued, when they were still in the combat area, subject to frequent bombing and other military action. Here, few have permanent housing, their parents or other caregivers are very tense, they find themselves in unfamiliar schools, and their friends from home are scattered to different places. Some other sources believe that this figure is high, estimating the local Jewish population at less than 5,000.